Set oven control to broil. Mix sugar and cinnamon. Brush both sides of each tortilla with butter; sprinkle with sugar-cinnamon mixture. Cut each tortilla into 12 wedges. Place tortilla wedges in single layer in 2 ungreased 15x10x1-inch pans or on 2 cookie sheets. Broil 2 to 4 minutes, turning once, until crispy and golden brown. Cool completely, about 15 minutes. In medium bowl, mix remaining ingredients. Serve salsa with chips. 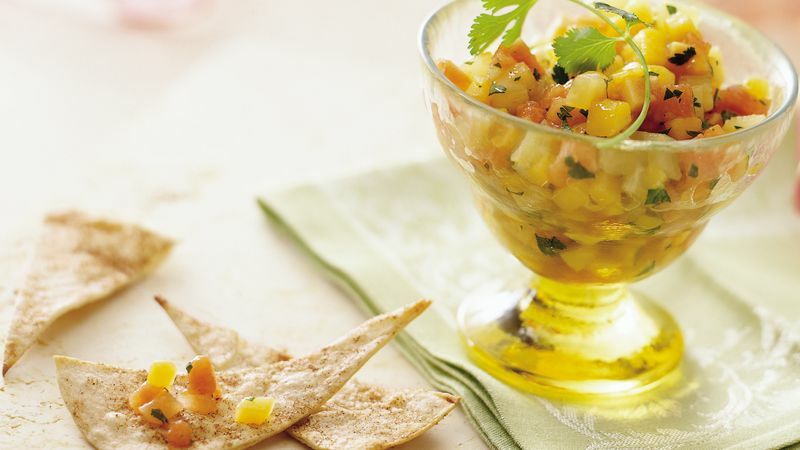 Use 3 cups pineapple and omit the papaya and mango for a refreshing pineapple salsa. Use a pizza cutter to easily cut the tortillas into wedges. The chips can be made up to one week ahead of time. Store in a tightly covered container at room temperature.